Argos lets you write GNOME Shell extensions in a language that every Linux user is already intimately familiar with: Bash scripts. More precisely, Argos is a GNOME Shell extension that turns executables' standard output into panel dropdown menus. It is inspired by, and fully compatible with, the BitBar app for macOS. Argos supports many BitBar plugins without modifications, giving you access to a large library of well-tested scripts in addition to being able to write your own. 100% API compatible with BitBar 1.9.2: All BitBar plugins that run on Linux (i.e. do not contain macOS-specific code) work with Argos (else it's a bug). Beyond BitBar: Argos can do everything that BitBar can do, but also some things that BitBar can't do (yet). See the documentation for details. Sophisticated asynchronous execution engine: No matter how long your scripts take to run, Argos will schedule them intelligently and prevent blocking. Unicode support: Just print your text to stdout. It will be rendered the way you expect. Optimized for minimum resource consumption: Even with multiple plugins refreshing every second, Argos typically uses less than 1% of the CPU. If you have a recent version of GNOME Software, you can also install Argos directly from there by simply searching for it. Note that this method may not always get you the latest release of Argos. Clone the repository, then copy or symlink the directory argos@pew.worldwidemann.com into ~/.local/share/gnome-shell/extensions. Restart GNOME Shell by pressing Alt+F2, then entering r. On some systems, you may additionally have to enable the Argos extension using GNOME Tweak Tool. 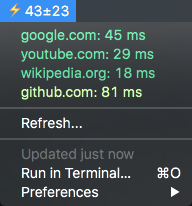 Argos plugins are great for monitoring your system, displaying anything that a command line script can output in a convenient, unobtrusive place. 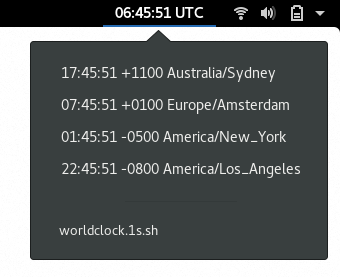 echo "<span color='#9BF' weight='normal'><small><tt>$LOG_ENTRY</tt></small></span> | length=40"
echo "View GNOME Shell Log | bash='journalctl /usr/bin/gnome-shell -f'"
As the plugin updates every second, new log entries are shown almost without delay. Plugins are not limited to displaying information – they can also perform actions when the user clicks on a menu item. This allows you to rapidly create launchers that look and act exactly like you want. 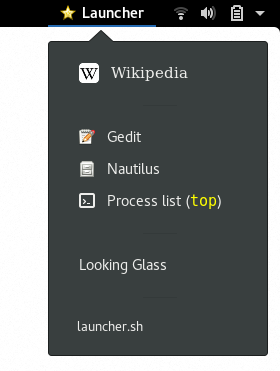 echo "Wikipedia | image='$WIKIPEDIA_ICON' imageWidth=20 font=serif href='https://en.wikipedia.org'"
echo "Gedit | iconName=gedit bash=gedit terminal=false"
echo "Nautilus | iconName=system-file-manager bash=nautilus terminal=false"
echo "Process list (<span color='yellow'><tt>top</tt></span>) | iconName=utilities-terminal-symbolic bash=top"
echo "Looking Glass | eval='imports.ui.main.createLookingGlass(); imports.ui.main.lookingGlass.toggle();'"
Note how the Wikipedia icon is downloaded from the web and serialized into the menu item without ever needing to be saved to disk. All of this comes from a file smaller than the configuration files of most dedicated "launcher" extensions, while providing much more flexibility. Argos plugins blur the line between configuration and code. An Argos plugin is just an executable file that writes to stdout. As such, any language can be used to create plugins. Switching from Bash to Python gives you easy access to the GNOME platform APIs, enabling even more powerful launchers. And there you have it: A working clone of a full-blown GNOME Shell extension – implemented using a fraction of the code. echo "$TOP_OUTPUT | font=monospace bash=top"
It's top at your fingertips! 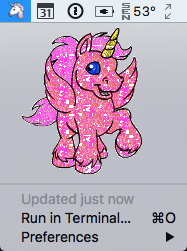 Of course, this approach works with any other terminal program as well. Note that the plugin checks the ARGOS_MENU_OPEN environment variable to ensure top is run only if the dropdown menu is visible, while the + in the filename forces a re-run whenever the user opens the menu. This pattern makes output available immediately when it is needed, but keeps idle resource consumption of the plugin near zero. Argos monitors the directory ~/.config/argos for changes. Any executable file found in this directory is considered a plugin. Files whose name starts with a dot (.) and files in subdirectories are ignored. Plugins are run and their standard output is interpreted as described below. For each plugin, a panel button with a dropdown menu is created. The arrangement of buttons from left to right follows the alphabetical order of the files they are generated from (except when a POSITION is explicitly specified in the filename). New plugins and edits to existing plugins are automatically detected and reflected in the panel. 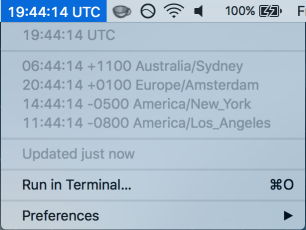 if INTERVAL is followed by +, the plugin is additionally re-run each time the dropdown menu is opened. POSITION may be omitted entirely (in which case the button is placed before all other buttons on the right-hand side of the panel) while INTERVAL can be left empty. 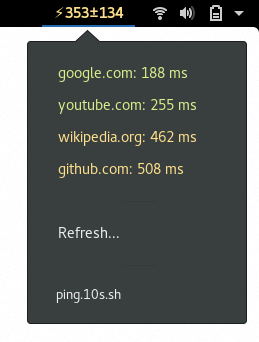 For example, a script named plugin.10s.sh is updated every 10 seconds, the button belonging to plugin.1c..sh is positioned just right of the GNOME Shell clock, and plugin.l.1m.sh is displayed left of the "Activities" button and updated every minute. All attributes are optional, so the most basic plugins simply print lines consisting of text to be displayed. To include whitespace, attribute values may be quoted using the same convention employed by most command line shells. Lines containing only dashes (---) are separators. Lines above the first separator belong to the button itself. If there are multiple such lines, they are displayed in succession, each of them for 3 seconds before switching to the next. Additionally, all button lines get a dropdown menu item, except if their dropdown attribute is set to false. Lines below the first separator are rendered as dropdown menu items. 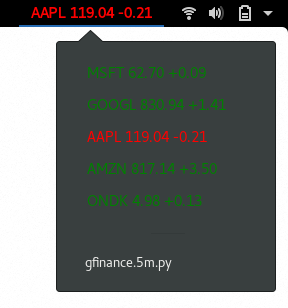 Further separators create graphical separator menu items. Lines beginning with -- are rendered in a submenu associated with the preceding unindented line. While Argos supports nested submenus in principle, GNOME Shell does not render them correctly. Emoji codes like :horse: :horse: and :smile: :smile: in the line text are replaced with their corresponding Unicode characters (unless the emojize attribute is set to false). 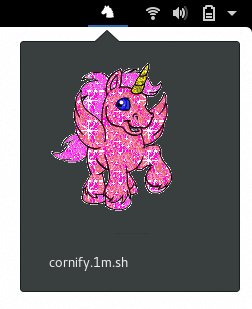 Note that multicolor emoji rendering requires GNOME 3.26 or later. ANSI SGR escape sequences and Pango markup tags may be used for styling. This can be disabled by setting the ansi and useMarkup attributes, respectively, to false. Backslash escapes such as \n and \t in the line text are converted to their corresponding characters (newline and tab in this case), which can be prevented by setting the unescape attribute to false. Newline escapes can be used to create multi-line menu items. Control how the line is rendered. 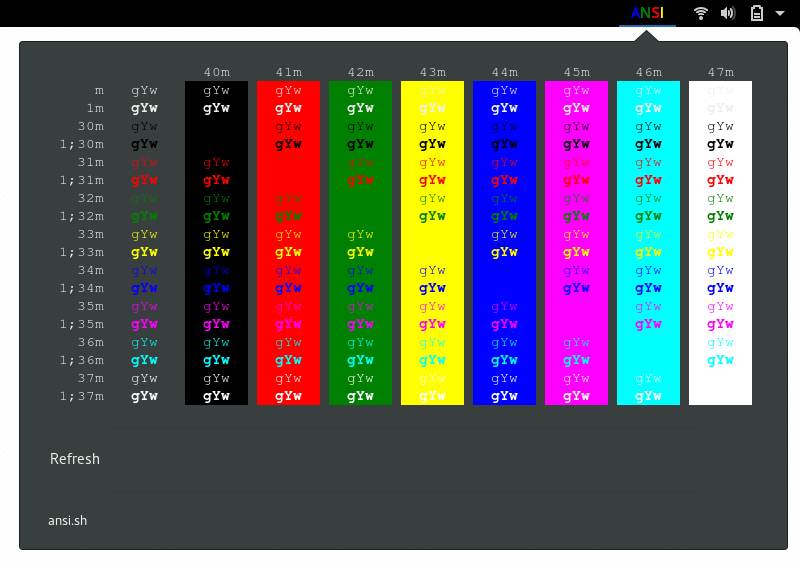 color Hex RGB/RGBA or color name Sets the text color for the item. font Font name Sets the font for the item. size Font size in points Sets the font size for the item. iconName Icon name Sets a menu icon for the item. See the freedesktop.org icon naming specification for a list of names that should work anywhere, or run gtk3-icon-browser to see the names of all icons in your current icon theme. Argos only. image, templateImage Base64-encoded image file Renders an image inside the item. The image is positioned to the left of the text and to the right of the icon. 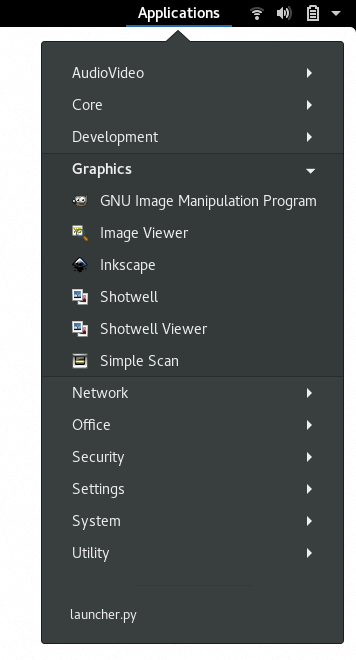 GNOME Shell does not have a concept of "template images", so image and templateImage are interchangeable in Argos. imageWidth, imageHeight Width/height in pixels Sets the dimensions of the image. If only one dimension is specified, the image's original aspect ratio is maintained. Argos only. length Length in characters Truncate the line text to the specified number of characters, ellipsizing the truncated part. trim true or false If false, preserve leading and trailing whitespace of the line text. dropdown true or false If false and the line is a button line (see above), exclude it from being displayed in the dropdown menu. alternate true or false If true, the item is hidden by default, and shown in place of the preceding item when the Alt key is pressed. emojize true or false If false, disable substitution of :emoji_name: with emoji characters in the line text. ansi true or false If false, disable interpretation of ANSI escape sequences in the line text. useMarkup true or false If false, disable interpretation of Pango markup in the line text. Argos only. unescape true or false If false, disable interpretation of backslash escapes such as \n in the line text. Argos only. Define actions to be performed when the user clicks on the line's menu item. Action attributes are not mutually exclusive. Any combination of them may be associated with the same item, and all actions are executed when the item is clicked. bash Bash command Runs a command using bash inside a GNOME Terminal window. terminal true or false If false, runs the Bash command in the background (i.e. 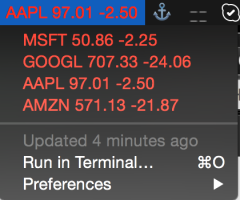 without opening a terminal window). param1, param2, ... Command line arguments Arguments to be passed to the Bash command. Note: Provided for compatibility with BitBar only. Argos allows placing arguments directly in the command string. href URI Opens a URI in the application registered to handle it. URIs starting with http:// launch the web browser, while file:// URIs open the file in its associated default application. refresh true or false If true, re-runs the plugin, updating its output. ARGOS_VERSION Version number of the Argos extension. The presence of this environment variable can also be used to determine that the plugin is actually running in Argos, rather than BitBar or kargos. ARGOS_MENU_OPEN true if the dropdown menu was open at the time the plugin was run, and false otherwise. These screenshots show how some scripts from the BitBar plugin repository look when rendered by Argos compared to the "canonical" BitBar rendering (macOS screenshots taken from https://getbitbar.com). GNOME Shell is a difficult platform to develop for. 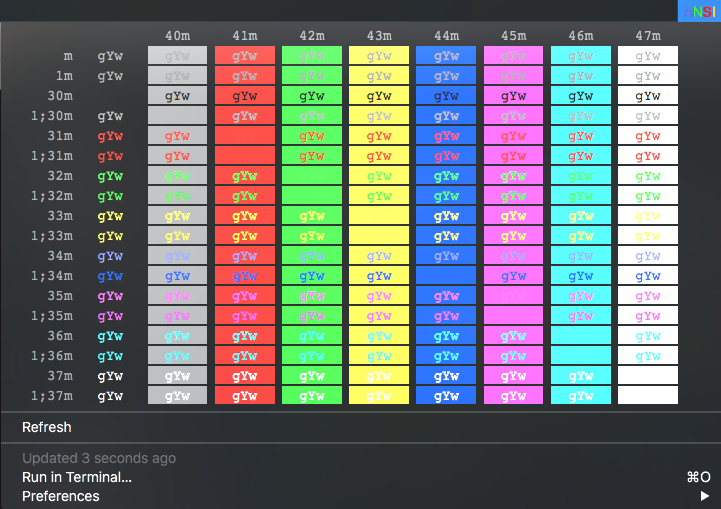 At the time this project was started, the Gjs documentation hadn't been updated in three years and was missing important classes (new documentation has since appeared). Once again, Valadoc saved the day for me. While not fully identical to the Gjs API, Valadoc is the best manual for GNOME on the web today. Argos includes emojilib's emoji name/character mappings. It's wonderful that such a comprehensive and well-maintained library is so easily available. Without BitBar, Argos wouldn't be what it is today, or, more likely, wouldn't exist at all. There have been many attempts on many platforms to simplify panel menu creation, but BitBar was the first to get it right by finding the balance between text-only configuration and dynamic output. Thank you for showing the way! Contributors are always welcome. However, please file an issue describing what you intend to add before opening a pull request, especially for new features! I have a clear vision of what I want (and do not want) Argos to be, so discussing potential additions might help you avoid duplication and wasted work.